Two Russian bombers were intercepted by Alaska-based fighter jets in international airspace west of the state on Tuesday, according to the North American Aerospace Defense Command. On Tuesday at 6 p.m. Alaska time, two Russian Tu-95 "Bear" bombers were intercepted by two NORAD F-22 "Raptor" fighter jets, a release said. 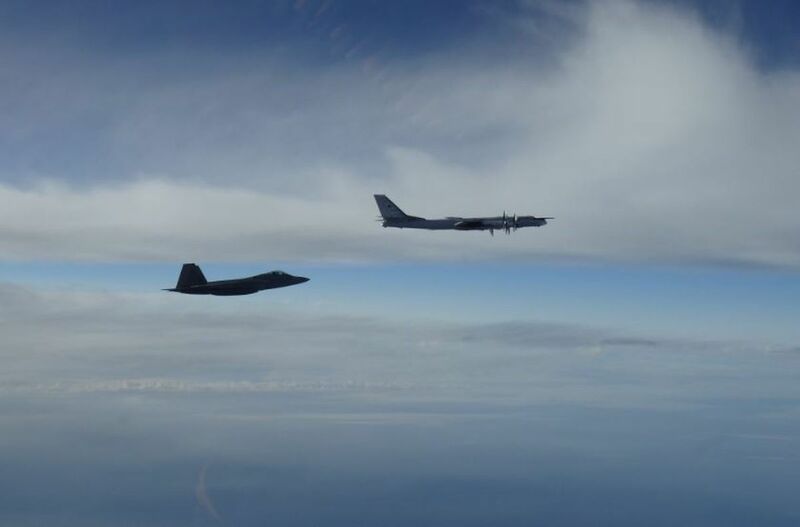 The bombers were flying north of the Aleutian Islands, and west of Alaska's mainland, in the Alaskan Air Defense Identification Zone, said Maj. Andrew Hennessy, NORAD spokesman. The zone extends about 200 miles off the Alaskan coast, and is mostly in international airspace. "The Russian aircraft remained in international airspace and at no time did the aircraft enter United States or Canadian sovereign airspace," Wednesday's release said. The aircraft were "intercepted and monitored" by the U.S. jets until they left the zone, heading west. The bombers didn't enter Canadian or U.S. airspace, NORAD said. Two Russian bombers were also intercepted in May.